When you’re a freelancer, your clients impact everything. Who you choose to work with (and how you choose to work with them) directly affects your income, lifestyle, productivity levels, mental health, and the satisfaction you gain from being self-employed. In other words, your relationships matter. And when they aren’t built on a solid foundation of trust, value, and mutual respect, business becomes stressful, and you end up plagued with the awful anxiety that comes with not feeling in control of your environment. No one does their best work in those conditions. But the good thing is, there are some simple ways to prevent that loss of control and instead build strong, pain-free client relationships that allow you both to flourish. 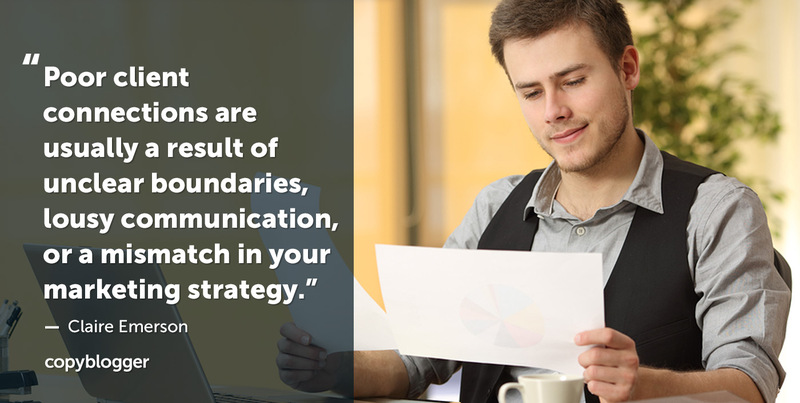 Poor client connections are usually a result of unclear boundaries, lousy communication, or a mismatch in your marketing strategy. Of course, these are all problems you can fix. But before we take a look at three powerful strategies that can make these things happen, we need to talk about what you accidentally might be doing to sabotage your client relationships. Creating clear boundaries between work and the rest of our lives is something all self-employed people have to do. It’s why we create terms of service and operational guidelines. But it’s not enough to just have these processes written down — we have to follow through. Letting small issues slide or giving in to “just this once” shows your clients that you don’t respect your boundaries, so why should they? If you’re filled with anxiety and unnecessary stress because of an off-putting or obtrusive client, you might need to reflect on how well you’re following your own rules. And tighten ship if necessary. The rules you set around your communication are just as important as some rock-solid terms of service. When you don’t set the expectation for how you do business, your clients will set their own. And I can guarantee they will expect more from you than you’re comfortable with (and are being paid for). This is where clear communication guidelines become invaluable. Avoid giving out your personal mobile phone number. Use an alternative like Slack or Skype for client calls and contact. If you use Facebook messenger, set up your auto-reply. Make sure your clients know that while you do check this channel, it is not a direct line that’s monitored 24/7. Tell them your preferred method. Limit your scheduled client calls to once a week. You can do a recap of the week prior and set the expectation for what you will deliver for the next week all in the same call. For smaller queries and questions, you want to be able to move them to a more convenient channel like chat. Consider scheduling time for chat/messaging. I use Slack for client communication and have in the past opened up a 30-minute window 3–4 times a week for Q&A and addressing minor problems. It works well if you have multiple clients. You can have a mini support session with all of them. Be sure to make it clear that you won’t necessarily take action on anything during the chat, but anything that requires more than a discussion will either get done within the next week, or will be further discussed in detail on your next call. Make your contact hours visible in your email signature. This a simple way to let your clients know when you’re available for contact and more importantly, when you’re not. Clear communication is critical to healthy client relationships and a less stressful workday. So set the expectation upfront, restrict access as much as possible, and stick to the boundaries you set. Check yourself: Are your expectations and emotions contributing to the problem? While it’s nice to be able to blame the client for any bad vibes creeping into your relationship — it’s wise to take a step back and see if you might be part of the problem. I know I have a tendency to overthink things and, at times, that has brought an excess of emotions and foolish expectations into my decision-making and communication. When you work for yourself (and likely, by yourself), it’s so easy to create your own anxiety (often about silly things). But training yourself with simple techniques and learning to strip away as much of the emotion as you can from your client interactions will make it easier for you to make smarter decisions, and gain the respect of the people you choose to work with. Amazing clients aren’t unicorns; they really do exist. And when you focus on clever prospecting, clear processes, and smart positioning — they’ll be much easier for you to find. It’s time to look at some tweaks you can make to avoid painful clients altogether. High-value clients are the key to smooth operations and an enjoyable work environment — it’s as simple as that. High-value clients respect you as the expert you are and value your time and input. And from what I’ve found, the most effective way to get this superior breed of client is to use superior methods for attracting them. Create more (and do it consistently). Content builds your authority and there are plenty of ways you can use what you create to promote your business, make more sales, and increase your value. Put yourself out there. Get on the radar of the people you want to work with. And once you’re there, showcase your expertise to the best of your ability (this is where content comes in handy). Networking is easier when you have the content to back you up. Make it obvious that you can be hired. Let people know you can solve their problem and have a clear contact funnel. Better yet, get so great at prospecting that you gain permission to contact them. Go after prospects who don’t need to be convinced of your value — they already get it. Value-based and respect-driven relationships reduce friction, headaches, and unnecessary back-and-forth between you and your clients. With roadmapping, not only do you showcase your expertise by making it clear how you can get your client from point A to point B, you can also charge for it. If you spend hours on proposals and designing plans for your clients’ projects, consider turning that process into a small one-off product. So, even if they decide to go elsewhere, you’re making money for the hard work you put into learning about your clients and what they want to accomplish. If you do manage to secure a new client, you want to make an impeccable first impression. And your onboarding process is your best opportunity to demonstrate your professionalism, set expectations for working together, and reinforce how you like to do business. I listened to an excellent episode of the Unemployable podcast featuring Jennifer Bourn, where she walks through the step-by-step system she uses to onboard new clients. It was eye-opening to see how easy it is to address many of those common problems that can arise with new clients. And how simple (and enjoyable) those processes make the rest of the work. When you have effective processes, you reduce the stress of dealing with someone new, and at the same time, you build trust with your client by keeping them informed and up-to-date. Clients love to know that you know what you’re doing. And a well-designed onboarding process instills confidence and makes it abundantly clear that you’re a polished professional who can deliver the results you promised. If your client pool is less than satisfying and your work is becoming less enjoyable and more draining, it might be time for you to make some strategic changes to the way you build and develop your relationships. Gain higher-value clients by improving your prospecting. Better clients = better everything. Position yourself as the expert with strategic roadmapping. Charging for the proposal ensures your clients get your best work. And you get paid for the time and effort you put in. Polish your onboarding process to demonstrate your prowess. You keep the client informed and at ease with a well-oiled system, as well as make your job easier. When you focus on building trust, value, and respect into your client relationships, not only do you gain better clients … the satisfaction and fulfillment from working with great people will feed into the rest of your life — allowing those areas to flourish too. Claire Emerson is an avid reader and writer who loves to help Freelancers flourish. You can catch her on Instagram here. I’d want to add that you should avoid clients that are your acquaintances. My father’s friend opened a pizza shop near my apartment and I wanted to give him a little boost by running his Instagram and Facebook profile. We agreed on terms (I charged him 50$ a month for photos, editing and posting regularly) and everything was fine for about 20 days, until he started questioning my methods. All of a sudden, he wanted studio photography with pro editing, which was not part of the agreement. I didn’t even try to ask for more money, seeing that he is an idiot, and I ended cooperation. Excellent point! Working with friends and family can get really tricky (and awkward). It’s great that you had the foresight to end the relationship early. Firing bad clients (confidently) is a skill I think we all need to develop. I actually had a paragraph addressing how best to approach that kind of conversation… but then took it out as I feel it deserves its own post! This is a wonderful post about freelancers getting a life and respect they deserve. It can be difficult to separate work from life in many instances. And the biggest culprit here is the smartphone. To stay off work when needed, one important step towards that is to turn off ‘tempting’ notifications. It’s easier to focus on other things in life when you’re not getting distracted with notifications. I love your point about getting the right clients. These people see a writer as a partner in business that promotes their business with content. Rather than someone to be given instructions. Thanks so much for reading! And yes, the partnership style of client relationships is so much better for everyone involved. Takes a bit of extra effort but totally worth it. As an account manager, and not a freelancer, these strategies still apply. Thanks for writing this piece- it gives voice to much of what I strive for in client communication, as well as the cringey feelings when you know you’re NOT setting the right boundaries! Onboarding processes can help define a mutually successful relationship from the beginning and is KEY. Thanks for reading, Anna! I think we’ve all had our fair share of cringey feelings. But getting those high-value clients — who really respect what you do — eliminates so much of that. Well done! This covers many of the pitfalls I see struggling copywriters and other service providers falling into. Your recommendations are simple although not easy to implement, since they involve changing some longstanding habits that may not seem central to business but actually are. Thanks for putting your thoughts together in this piece. Hi Claire, thank you for this article. I’ve found that doing a bit of background check on the client before working with them is the most important step. This is because, some clients, no matter how good your communication is, are still going to be difficult. I’ve only had one or two clients that are difficult to work with. And by difficult, I mean, not paying on time or replying to messages on time. Even that, to me, is not difficult. Most of the clients I work with are generally great, which is often a result of doing adequate research on them before starting a relationship in the first place.